This book contains dozens of new monsters found in the Inner Sea region - all invented specifically for the Pathfinder campaign setting. Some, like the gearsmen of Numeria or the moth-like star monarchs who serve the goddess of dreams, have been mentioned many times in Pathfinder Campaign Setting books, but others, like the alien vespergaunt or Rahadoum's desert-dwelling whirlmaws, have only been obliquely illustrated or mentioned before. And some - like the mysterious and ancient veiled masters, and the disturbingly alluring fungus queen - make their appearance for the first time in print after debuting in Paizo's office campaigns. New monsters ranging in challenge rating from 1/3 (such as the mysterious syrinx) to 25 (the powerful infernal duke Lorthact). Three new monstrous templates: the exotic mind-draining vetala vampire, the blighted fey of Fangwood, and the twisted mutants of the Mana Wastes. Five new 0-Hit Die races ready for you to customize as villains - or playable as characters if that suits your particular game. Beings both benevolent and destructive - 48 in all - ready to challenge adventurers in any Pathfinder game. 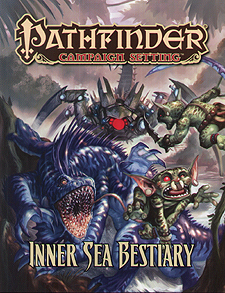 The Inner Sea Bestiary is intended for use with the Pathfinder Roleplaying Game and the Pathfinder campaign setting, but can be used in any fantasy game setting.